While I’m not generally into beauty products, I am SPF obsessed. I try just about every sunscreen that comes into the office, so I can have a stash of the best ones for each occasion. For example, there’s the sunscreen you wear walking around town (to the subway, to work, to appointments). This has to be something not too smelly (everything is a little smelly, after all) and not sticky at all. 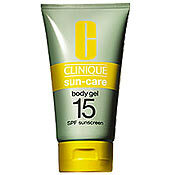 My new favorite is Clinique’s Sun Care Body/Corps Gel (I used the SPF 15, except on my hands, which I slather with Malin + Goetz 30). The Clinique Gel feels refreshingly cool when it goes on, and then seems to miraculously get absorbed into your skin. No odor, no stickiness, nothing. But I can attest it works even in a beach-like sun environment, because I also tried it for a couple hours of sitting on my sunny balcony and I did not burn at all.